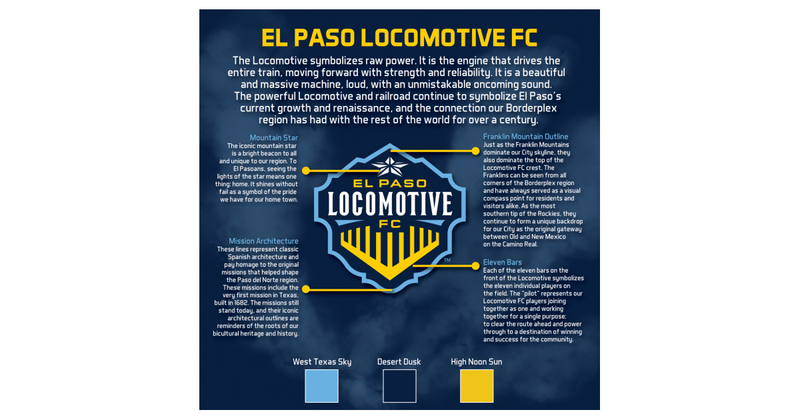 EL PASO, Texas–(BUSINESS WIRE)–Today, at a high-energy presentation at the EPIC Railyard Event Center, officials from MountainStar Sports Group announced that El Paso Locomotive FC is the name of the newest USL team in the country. The El Paso Locomotive will compete in their inaugural season at Southwest University Park beginning in March of 2019. El Paso Locomotive FC’s team crest was also revealed today. The centerpiece is a classic and commanding locomotive engine which includes 11 bars representing the team’s 11 players on the field who play together to defend and lead the team to victory. The outline along the bottom portion of the crest pays homage to the region’s mission style architecture while the top half represents the Franklin Mountains. The crest also includes a tribute to El Paso’s mountain star. The team colors are High Noon Sun (yellow), West Texas Sky (light blue) and Desert Dusk (navy). The team name reveal event also featured the unveiling of El Paso Locomotive FC merchandise and apparel. Shirts for men, women, and children, as well as an assortment of adjustable hats, were popular items available for purchase. Locomotive fans and supporters were quick to buy sweatshirts, tank tops, koozies, lanyards, water bottles, and keychains. Immediately after the event revealing the new team name, El Paso Locomotive FC merchandise became available for purchase at the Team Store located adjacent to the Santa Fe Street Gate at Southwest University Park. The store will be open until 8:00 p.m. on Thursday, October 4th. On Friday, October 5th, the team store will be open from 9:00 a.m. to 5:00 p.m. Starting October 6th, the team store will be open from 10:00 a.m. to 5:00 p.m. Fans and supporters can follow the El Paso Locomotive FC at www.eplocomotivefc.com and on Facebook/Twitter/Instagram at eplocomotivefc. El Paso Locomotive’s first game will be played in March of 2019 at Southwest University Park. Season ticket membership, and group and hospitality information can be found at www.eplocomotivefc.com or by calling 915-235-GOAL. Tickets for all these products are now on sale. For more information about El Paso Locomotive FC, please visit www.eplocomotivefc.com. Founded in 2012, MountainStar Sports Group, LLC (MSSG) is dedicated to initiatives that promote economic development and enhance the quality of life throughout the Borderplex region. MSSG’s main focus has been on the acquisition, development, and operation of professional sports and entertainment opportunities for El Paso, Texas, and Ciudad Juarez, Mexico. MSSG owns and operates the El Paso Chihuahuas, the Triple-A affiliate of the San Diego Padres of Major League Baseball, and El Paso Locomotive FC, an expansion soccer club of the United Soccer League. MountainStar Sports Group is also a co-owner of FC Juaréz (Los Bravos) of Mexico’s Liga Ascenso in the Mexican Futbol Federation. The owners of MSSG are Woody Hunt, Paul Foster, Alejandra De la Vega Foster, who serves as Chair of Los Bravos, and Josh Hunt, who serves as CEO of MountainStar Sports Group. Alan Ledford is President of MSSG.